Let's flashback to the beginning of the 21st Century. 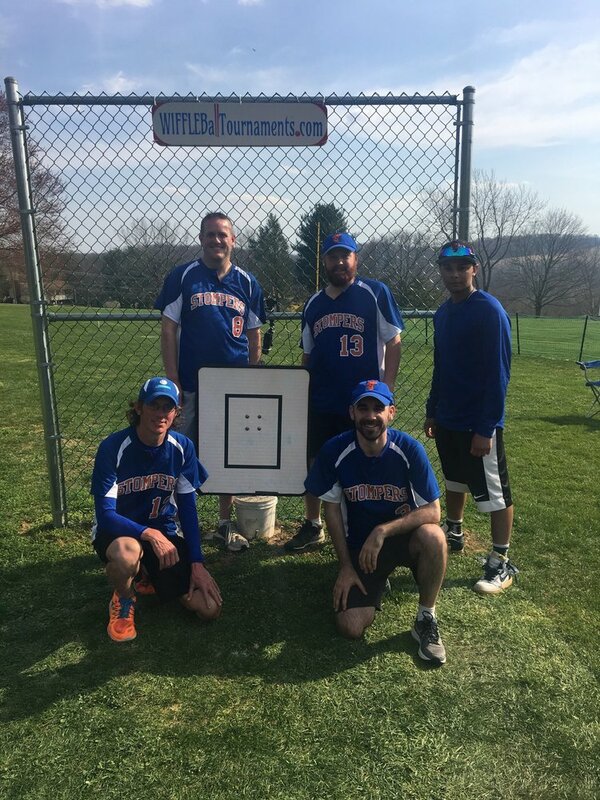 The Stompers, from Gaithersburg, Maryland, were one of the youngest and best wiffleball teams in the entire country. Their enthusiasm, will, and talent made up for a lot of their youthful inexperience and the cream eventually rose to the top. At least it almost did. The Stompers finished third at the 2003 Fast Plastic National Championship, perhaps just a missed sacrifice fly conversion away from the title! Arm troubles, professional careers, and other obligations abruptly turned this young, talented powerhouse dormant with many of the longtime USPPBA and Fast Plastic veterans wondering where the talented youngsters went. Those that knew them well knew they didn’t head down the path of Dwight Gooden or Daryl Strawberry, but the questions lingered. Welp, wonder no more – they’re back! They’re retooled! They’re dominating the competition and they are currently THE BEST TEAM IN FAST PITCH WIFFLEBALL! That is a statement that I stand by and will backup with explanation as you read on, but first, who exactly are the 2018 Stompers? Not much has changed on that front. They are still led by their heart and soul, Tim “The General”, Cooke. Cooke is as intense as they come on the wiffleball field – have you ever even seen the kid crack a smile while playing? – and his team follows suit. I don’t want to give Tim a bad rap. Off the field he moonlights as the MAW Director and is as nice of a guy as you could meet but its a different story on the field. He calls the shots for this veteran squad and knows how to keep his team rolling and winning. Cooke’s attitude and want can be seen with his supporting cast. He is one of the best managers in the history of wiffleball, now he’s on a mission for the hardware to prove he belongs with names like LoCascio, Ledge, Palinczar, Tariela, Ventresca, Derek Anderson, Chad Anderson, and Lavoie. Tim’s not only the emotional leader of the Stompers he also brings a valuable balanced hitting attack. His bat ranks in the upper tier for both average and on-base percentage through one-and-a-half MAW Seasons and he has shown capable power, hitting five homers along with some key knocks off top tier pitching. Tim isn’t the only Cooke on the Stompers. His brother Paul is also integral part of the squad. While Tim and Paul are not similar in looks, behavior, or approach, they are both quite good at winning. Paul Cooke is not known for his bat yet is still one of the most feared hitters in MAW.But why? How about an on-base percentage of 0.462, just slightly down from his .520 OBP in 2017. Paul is one of the toughest outs in MAW because he demands the pitcher to throw strikes, a key part of winning especially in wiffleball! While Paul typically sets the platter for the “big boys” in the Stompers lineup, don’t sleep on his bat either as he will make you pay. The other longest tenured Stomper is Dan “Doc” Isenberg. Isenberg, who at the turn of the century offered a dynamic lefty-righty 1-2 combo on the flat-hill with Schaefer, is now relied on for his power bat and occasional mop-up duty on the mound. Age and injuries have caught up to the one time shutdown lefty, who in 2002 was one of the best left handed pitchers in the country. He is still able to win games for his Stompers squad when called upon, keeping their “aces” fresh. Doc brings a powerful lefty bat to the Stompers’ lineup and not much has changed in 15 plus years. Extreme power and a ”swing-away approach”. You never know when Doc will strike, making for him and Paul Cooke an extremely tough back-to-back pitching matchup. Then there is “Hollywood” Nick Schaefer. I’m not sure how he did it and how he is still doing it. Schaefer is one of the very best – if not the best – true pitchers in the history of competitive fast pitch wiffle ball. Schaefer truly pitches. Think Greg Maddux - that’s Schaefer but commanding with a freakin’ plastic ball with holes in it. Schaefer doesn’t dazzle you with speed but rather hits corners and has anywhere from 6-26 pitches. That’s a slight exaggeration but he always seems to manage to throw something new at you in the last inning. Schaefer’s a great competitor and person. If you ever want to watch someone pitch – this is the guy. He is crafty and fun to watch. Schaefer, who at one time was the Stompers ace, is probably now #3 on their depth chart, making them quite scary to deal with. It’s equally scary as he’s likely to only have to pitch one game these days. Schaefer’s never really been known for his bat but since his re-emergence in MAW he has hit 8 homers in just 17 games, a couple which were game winners! Dan Isenberg and Nick Schaefer chat in between games at a recent tournament. While the above players listed were good enough to win the 2017 Inaugural MAW #1 tournament, the talent doesn’t stop there. They retooled for 2018, adding Jordan Robles, on the short list for the best player in the country and now the Stompers ace. The Stompers brought in Robles at the end of 2017 and he takes the ball late in tournaments. Robles is a strike throwing machine with plus-plus velocity. He has dominated the competition on the flat hill and was the 2017 MAW Playoff MVP! Robles also has a big time stick with serious power. He swings for the fences and offers huge pop to the Stompers’ already balanced attack. The final Stomper on the list is a newcomer for 2018, Chris “Red” Sarnowski (or Red Sarno for short). Red seems to be the final piece of the puzzle for this already dangerous team as he rounds out their staff and puts their lineup over-the-top. Red is the son of wiffleball legend Chris Sarnowski, aka Sarno, who is best known for his years with wiffleball powerhouses State of Mind and HITSOM. Much like his dad, the younger Sarno is a two-way star. He has plus velocity and variety of pitches to keep hitters off balance. He also boasts a rubber arm (throwing every inning in 2018 MAW #2 in route to the tournament title and tournament MVP award), which takes a lot of pressure off of Robles, Schaeffer, and Isenberg. However, what may be more impressive than his pitching is his stick! Red is a complete hitter, he has serious power but also great contact skills and discipline. This allows him to fill up the stat sheet and consistently be on base, which as you know leads to runs and leads to victories! So why is this group of wifflers the best team in fast pitch competitive wiffleball today? The answer is simple – winning, winning, and more winning. Since Tim “The General” Cooke pulled the strings and brought Robles onto the team, they have not lost a tournament. Granted, there aren’t many fast pitch tournaments around to judge teams anymore but this group is doing it against what is without a doubt the best fast pitch tournament competition available today. The Palisades Wiffleball League is exceptional and boasts some of the best, if not the best, collective group of talent but their league play and franchise structure does not allow for open market teams to form, so they cannot be considered part of this discussion. Robles plays on the Palisades Padres and is one of the favorites to win that league. Golden Stick fast pitch has died off much like that of Wiffle Up! before it. However, current Stompers Robles and Sarno have fared quite well in the GSWL medium pitch format with Robles finishing as the runner up at last year’s nationals and Sarno winning the first 2018 GSWL Medium Pitch NY Super Qualifier. Then there is National Wiffle, which isn’t national at all and only seems to hold one tournament a year. The NWLA may have some beef but they use all-star teams from local league and also only play one (two for some teams) semi-open market tournament a year. A fair amount of NWLA teams have made their way to MAW but they have been unable to defeat the Stompers. So that leaves the Fast Plastic Texas Open, which is a standalone annual tournament. Winning a tournament can make you the best that particular day but not necessarily THE BEST. To be the best you must compete against the best, consistently, and come out on top. The Stompers are doing just that. The newest Stompers, Chris Sarno and Jordan Robles, at MAW's Opening Day tournament in April. To close out the 2017 season the Stompers went 9-0. They won the September MAW tournament and swept the 2017 MAW Playoffs to become the first Mid Atlantic Wiffle Champions. From that point on, all they have continued to do is win. In 2018 so far, they went 5-0 at MAW tournament #1 in April and won another championship. At MAW tournament #2 in May, they were short-handed with only the Cooke Brothers and Sarno left to do the pitching. They won that tournament as well going 5-1. The Stompers’ record since the addition of Robles is 19-1 and the scariest part is that they have yet to be at full strength for a tournament. Say what you want but until they get knocked off they are the best in the game right now. If you don’t think so, then come prove it. These guys play in tournaments all year long and support the game and growth of wiffleball. For them it is all about playing the game and winning. Money says they’ll beat you too! Now get out there, practice, and as the Stomper’s Robles would say “Lace ‘Em Up!” Time to take the Stompers out!